"This is as close as I have found to the apple pancake at the Original Pancake House. A fluffy, sweet pancake. 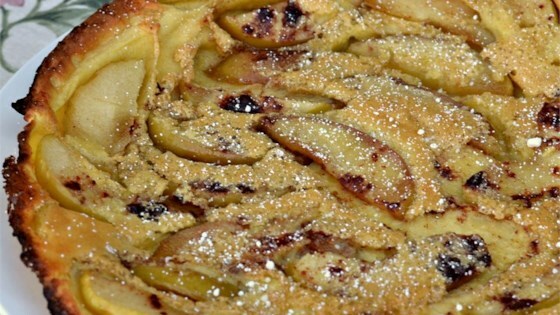 Excellent with a scoop of vanilla ice cream"
Melt butter in an oven-safe skillet over medium heat; cook and stir apple slices, about 1/4 cup sugar, and cinnamon in butter until apples are tender, about 5 minutes. Beat eggs, milk, flour, remaining 1/4 cup sugar, baking powder, vanilla extract, and salt in a large bowl until batter is smooth; pour batter evenly over apples. Bake in the preheated oven until golden brown, about 10 minutes. Run a spatula around the edges of the pancake to loosen. Invert skillet over a large plate to serve. AWFUL...this is not a pancake. Too much egg not enough flour. It comes out like a sweet Apple omelet. No one could even it it. ?? This is a very good recipe. I forgot the sugar in the flour mix. I drizzled honey over the top at the end of baking to make up for the lack of sugar, and it tasted good. I made this today (A coeliac friendly version, using gluten free flour & 1/2 tsp Xantham Gum). It tasted delicious! Thank you for sharing!